The last time I saw him was two years ago, here in United States, at Grandma’s home. And it was then that I began blogging. Thank you again Uncle Ernie for you kind hospitality eight years ago, and I am glad to now call you as my ancestor. May you rest in peace. 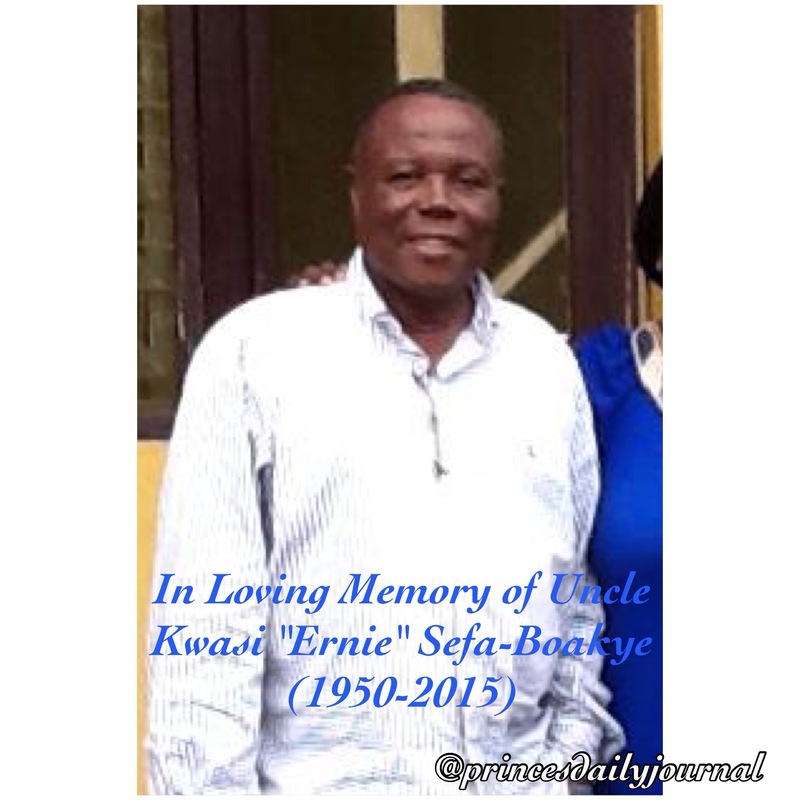 Uncle Ernie survived by his two children Jeffrey and Jennifer Sefa-Boakye. Here is an eulogy given on my behalf of my family. The reason why I remembered my uncle’s voice so well is that he taught me how to laugh and enjoy life. He saw a lot of things in me that I had not figured out yet. He stressed to me that I was different. My uncle’s voice was so filled with joy and laughter. Even in the face of fear and disappointment. I know this because my uncle broke my state of shyness and anxiety from the first moment he saw me. My uncle taught me many things, communication being the most important. He taught me how to carry a conversation. Uncle Ernie’s tactics of speech definitely rubbed off of me. I used to be very quiet and listen to what others say. Uncle Ernie would start a conversation with a joke, to comfort everyone’s soul, and then would end it with words of wisdom from his heart and mind. He definitely contributed to my growth as a young man. God, in deed, works in mysterious ways. And as I grow day-by-day, I notice that I draw from some of his attributes in myself, especially his love for music. Although my times I spent with uncle were numbered, I still feel him everyday because he is with me. I feel comforted knowing that I can speak to him whenever I need to. In these sad times of death and mourning, I pray we all come to understand that our loved ones continue to live through and with us–even though they are not here physically.